It's out today! In print! I'm really happy with the way Batman '66 looks in its print incarnation. The colors reproduced beautifully, and while the bells and whistles of the digital edition are definitely fun, as a comics artist, this is still my preferred way to enjoy comics. That said, if you want to grab part 3 of the digital run, it's probably our best use of the technology yet. Get the technology at Comixology. Bat-Rap. And, to celebrate this release, how about some watercolor commissions? These are hot off my desk and headed out to their new owners today. Batman '66 Makes its Comixology Debut - Today! 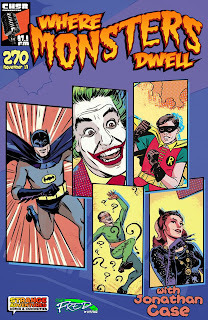 Batman '66 is out, in a digitally-enhanced edition. It's weekly. It's all-ages friendly. And it's 99 cents on Comixology. How about that? "But wait," you say, "what's all this about digitally enhanced blah-bah-dee-blah? Are you trying to get me to read motion comics?" No, in fact. Today's release is more like a guided-view comic (where the Comixology software escorts you around the page elements), but with some significant perks, driven by the creators. The entire print comic has been reworked, expanded, and retooled by me, personally, then handed over to the engineers (I like calling them that) at Comixology. So all the enhancements are largely based in what our small creative team wants readers to see, and (importantly) what we think will look cool. Here's a quick look at how we make the sausage. I drew all the art as if for print, with the narrative connections from panel to panel that are essential to reading a print comic. I wanted to make a comic book, so when you pick it up in stores, it's going to look like a comic book should look. After I completed print art, I set about expanding certain sections for the digital version based on a master plan created with Jeff (writer), Jim (editor), and John (Comixology guru). Man, that makes 4 'J's' on this book. Never thought of that before. ANYWAY. One effect I'm proud of engineering is the Batmobile's big reveal, where we do a fast pan from one panel, through a field of clouds and speed lines, to the next panel, and a big impact shot. Initially, Comixology warned that the effect might require an image too large for their system, but they made it work, and I think it came out very well. Wired has a video of all this on their website (thanks, Wired! ), plus some further discussion, so you can check it out for yourself. So there's a taste of what your 99 cents buys you. I'm really looking forward to seeing this in print, but I'm also glad that people who buy digital get added value. Not to stop anyone from buying both, certainly. Have a great comics Wednesday, everyone. The Twitterverse is all lit up with good Bat-vibes (eh? ), so this wild experiment may have worked.